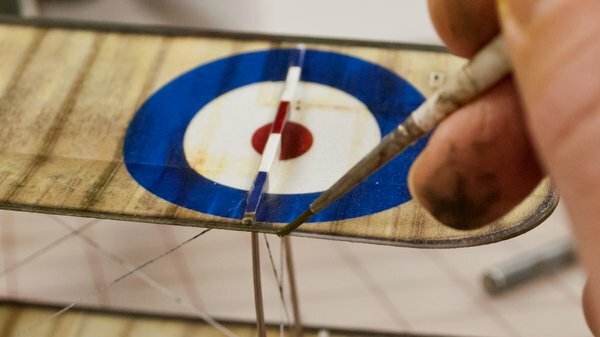 By Terry Dunn on March 27, 2019 at 12:12 a.m.
Terry recently discovered a series of tiny airplanes that use innovative materials and techniques to achieve incredible realism. Most RC aviators enjoy adding accents to make their scale models appear more realistic. 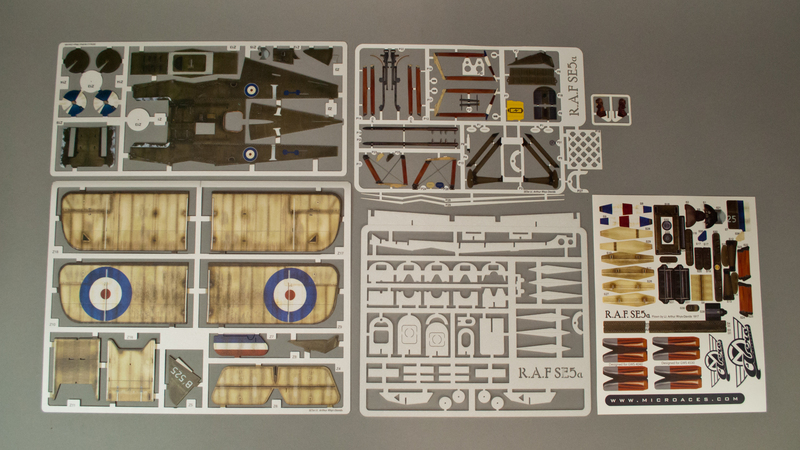 We'd love for them to be as detailed and precise as static plastic models. Yet, the weight and structural constraints of a flying replica often dictate that we have to settle for "good enough." Smaller models typically demand more concessions than larger ones…but not always. 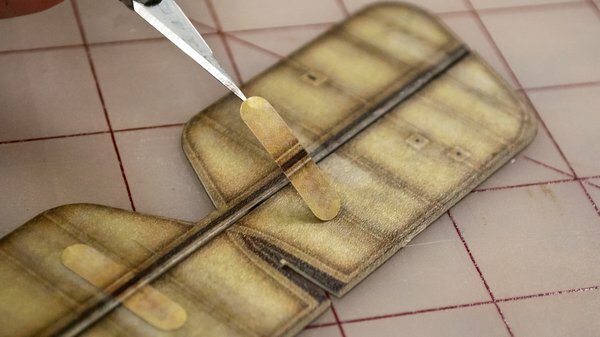 I recently discovered a series of tiny airplanes that use innovative materials and techniques to achieve incredible realism. 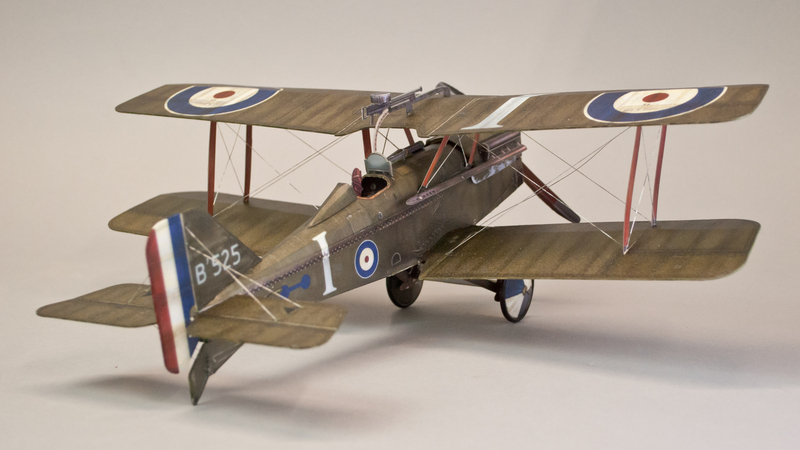 Microaces is a small, UK-based company that produces a line of ultra-micro RC models replicating WWI-era aircraft. At first glance, these airplanes actually look like well-detailed static models (close to 1/24-scale). Closer inspection reveals the functional control surfaces and electric motor that make them airworthy. Like many ultra-micro RC aircraft, Microaces kits are constructed primarily of foam. The truly unique aspect of these kits, and a key component to their realism, is that the foam is factory-printed with realistic color schemes. All of the details such as stitching, panel lines, insignia, unit markings, and weathering are all there when you open the box. The Microaces SE5a kit is built from foam and plastic parts that are factory-printed with a historically-accurate color scheme. Microaces offers kits for several different WWI aircraft. Most of them are available in multiple historically-accurate trim schemes. I chose to build the "Heavy Weather" SE5a that depicts the fighting steed of British ace, Arthur Rhys-Davids. 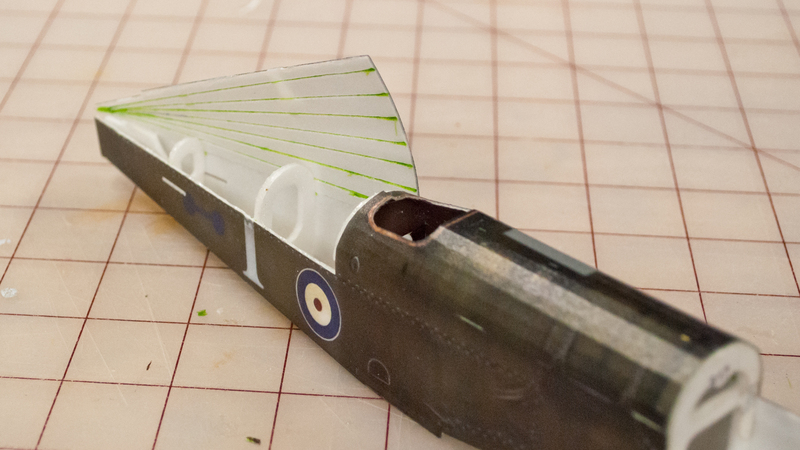 With a wingspan of only 14.5" (368mm), this model could be completed as a static desktop display. But there was never any doubt that my example would be built to take to the sky! The printed foam parts are factory-cut to shape, but they must be separated from their parent sheets. Some parts are 2mm-thick foam, others are 1mm-thick. There are also printed parts made of 200-micron polypropylene plastic, polyester stickers, and a few other assorted bits. Microaces suggests this kit for intermediate-level builders and I agree. Because of the unique blend of materials, I often found myself performing tasks that I'd never done on any previous models. I did not find anything to be particularly hard. Some aspects were just new and different to me. I took my time to understand and savor the new techniques and did not encounter any big hurdles. No printed manual is included, but there is a very nice set of online assembly instructions. I am very impressed by the visual appeal of the manual. 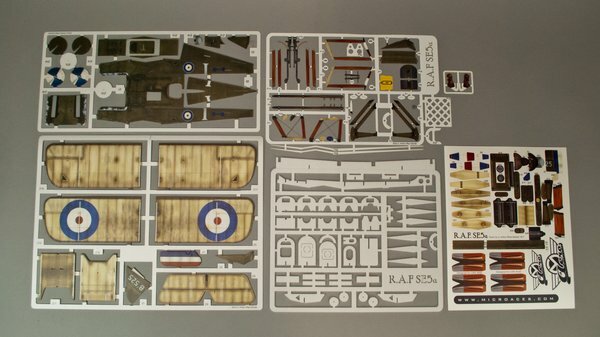 It is probably the nicest looking set of instructions I've ever seen for an RC model. 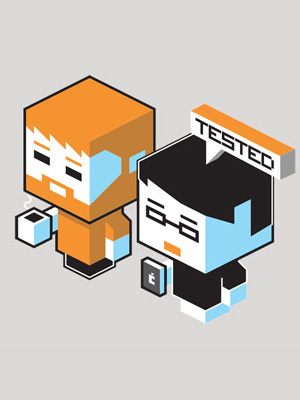 While not perfect, the clarity and thoroughness of the manual are also quite good. UHU por glue was used for most of the assembly steps. A few different glue types can be used, including foam-safe cyanoacrylate (CA – super glue) and aliphatic (wood) glue. 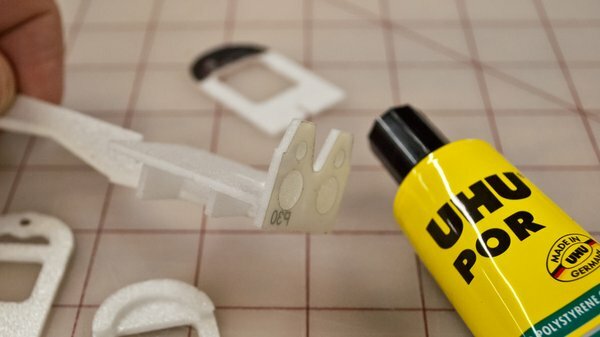 Microaces recommends UHU por contact cement so that's what I used for most steps of building the SE5a. I utilized foam-safe CA in a few select areas where I wanted an instant cure. I was a little concerned that the spray-on CA activator I used could smear the foam's printed finish, so I tested a few spots before committing. It worked fine, with no damage. Assembly begins with the fuselage. Much like a wooden boat, bulkheads are attached to a keel to define the fuselage's overall shape. Right out of the gate, I was integrating foam, plastic, and stickers. It started to look like an airplane quickly! Note how the inside surface of the top sheeting was scored with a marker to make it more flexible. The top of the fuselage is rounded somewhat sharply. Slight massaging of the foam sheeting is necessary to achieve the tight bends without breaking. The manual provides templates and tool suggestions for this task. I found success using an ultra fine point Sharpie to score the inside of the sheeting where indicated. If you take the same approach, be sure to use a light color marker so that the lines do not show through to the outside. 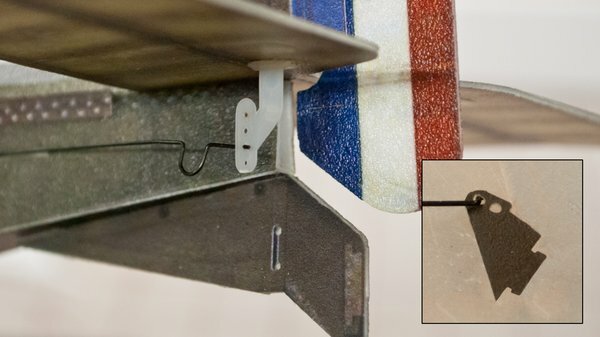 A consistent hinge gap is necessary for the control surfaces (rudder and elevator) to work properly. The best method I found was to secure each mating pair of foam parts to my workbench (using low-tack masking tape) with a .5mm drill bit between them to set the correct gap. I then applied the sticker hinges with a hobby knife. The control surfaces are hinged with stickers that blend into the airplane's finish. The wings are assembled with the aid of a foam jig that sets the correct dihedral angle of the outer panels. I originally used UHU por on these critical joints. While the flexible nature of this glue is often advantageous, I felt like it was a detriment here. The wings just did not feel rigid enough to sustain any significant loads. I added foam-safe CA to the glue joints and that helped tremendously. For me, the most challenging step of the build was attaching the top wing to the bottom wing and struts. I had to be very careful to avoid introducing any warps that might negatively affect the model's flight performance. Numerous position adjustments were necessary (as the UHU por dried) before I was satisfied that everything was properly aligned. Thread is provided to recreate the wire rigging that strengthens the wings and tail feathers. It is actually functional on this model. I used a normal sewing needle to install the thread. I was initially able to get the rigging taut and locked into place, only to find that some segments had slackened by the next morning. I am not sure if the thread stretched or the airframe relaxed. Common ultra-micro RC gear works well in the SE5a. This radio brick and brushed motor were included with my version of the Microaces kit. Radio gear and propulsion for the SE5a come from off-the-shelf components found in many of the popular ultra-micro models from Horizon Hobby. The Microaces kits can be purchased with or without house-brand versions of these components. My SE5a has the house gear. A small radio "brick" contains a 2.4 GHz receiver (available with Spektrum, Futaba, and FrSky compatibility), a speed control for the brushed motor, and two tiny linear servos. I added a 1-cell 150mAh LiPo battery. 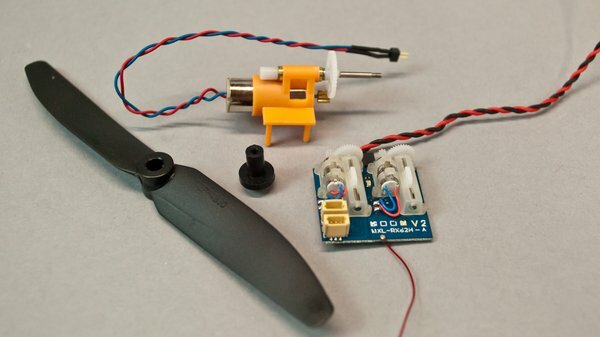 The micro-sized brushed motor spins a 4.5" (114mm) propeller through a gearbox. Stickers on the propeller blades give it a wooden appearance. I was concerned that the stickers would cause the propeller to be out of balance. But it runs true and vibration-free. The stock control horns (inset) fit loosely on the pushrods, so I replaced them with tighter-fitting units. Throughout assembly of this SE5a, I was very impressed with the quality of the parts and how well they fit together. It is a superbly-engineered model. The only stock components that I elected to replace were the control horns. I felt that the pre-drilled holes were excessively large for the included pushrods and might cause sloppy control response. I replaced the horns with units scavenged from a crashed Horizon Hobby ultra-micro model. One of the most distinctive features of the real SE5a was a Lewis machine gun mounted to the top wing. A curved track allowed the pilot to pull the gun down near the cockpit for in-flight reloading. This arrangement is replicated in the micro model with printed plastic (gun and track), foam (ammunition drum body), and a sticker (drum sides). The result is a very lightweight, but convincing reproduction. Similar details can be found throughout the model. This SE5a has an unparalleled finish. The printed surfaces, however, contrast sharply where there are raw white edges of the foam. This was most noticeable on the wings and tail feathers. I used water-based acrylic paint to touch up these edges and make them blend more naturally. I also "dirtied" the bright white flying wires with random smears of green and grey paint. My completed SE5a weighs 1.5 ounces (42.1 grams). It balances precisely where indicated in the manual with no ballast necessary. As much as I enjoyed simply admiring the war-weary looks of this model, I was anxious to get it in the air. I linked my Spektrum iX12 transmitter and tested all of the controls. Spring has been elusive here in Buffalo. So I made my way to the local park with airplane, radio, and snow shovel in hand. After clearing snow to create a modest runway, I was ready to fly. The completed SE5a could be an impressive static model. But this baby flies! The SE5a has plenty of power for quick, non-scale takeoffs. I'll practice more sedate departures once the snow is gone. On subsequent outings, I discovered that this model can be easily hand-launched as well. With 3-channel control, the SE5a is not really intended for aerobatics (although it does perform lovely loops). It is most at-home flying low, close circuits where you can really admire its scale profile. The rudder and elevator both have good authority and the model behaves well. This airplane is most convincing when flown with smooth control inputs. It can be yanked around if you like, but it may protest. It yells at me with a few pitch oscillations when I get too heavy-handed on the sticks. I've flown the SE5a with a slight breeze and I could practically bring it to a standstill when headed into the wind. This slow flying ability also allows it to be flown in larger indoor areas such as a basketball court. As with many ultra-micro models, this one gets bounced around a bit when you find patches of rough air. I've never felt, however, that I was not in complete control. 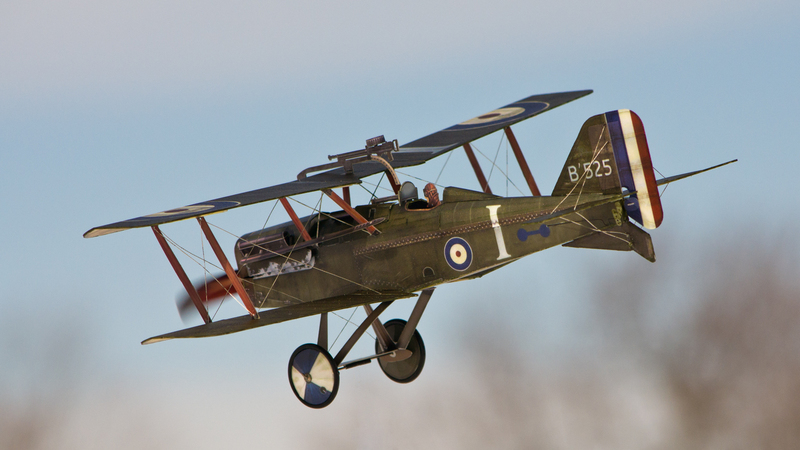 Although not well suited for rookie pilots, this SE5a flies well and looks amazing in the sky. Microaces lists this as a model for beginner pilots. I do not agree. This airplane is not difficult to fly, but I think it is too responsive and maneuverable for fledgling pilots to handle. I believe the SE5a would be a great model for pilots with a little previous experience. I also think it would provide a super introduction to the nuances of ultra-micro flying for veteran pilots of larger, more-traditional RC planes. I always love to try new things in the RC world and the SE5a from Microaces certainly qualifies. It demands some time (and a mind open to new techniques) to get it put together. The unique blend of materials and printed features creates a model unlike anything else in my fleet. It seems impossible for such a detailed model to fly at all. That it actually flies quite well is pure icing on the cake.